Such a beautiful favor that expresses your commitment to your faith; guests will be touched and will surely make this a cherished keepsake from your celebration. The base of the votive is made of poly resin in an ivory color and features lovely gold leaf swirl accents. The vintage cross is poly resin in an ivory color with an intricately carved swirl design, highlighted in a gold leaf finish. A glittering rhinestone accent is placed in the centre of the cross. The votive is made from frosted glass and fits into the base with the cross rising up in the front. The votive comes filled with a poured white candle. 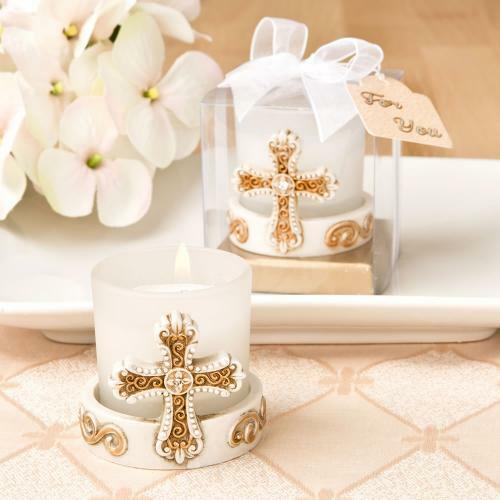 If you are looking for the perfect Christian faith based favor for your next event, this beautiful vintage cross and votive will be the ultimate choice! Size is 2" x 1 3/4"
A stunning table display and thoughtful favor for any Christian faith based occasion! Please allow up to 5 business days to fulfill your order.